The Doctor, Amy and Rory land in what appears to be a hotel. They are trapped there with four other people. They soon discover they each have a room which holds their deepest, darkest fears. 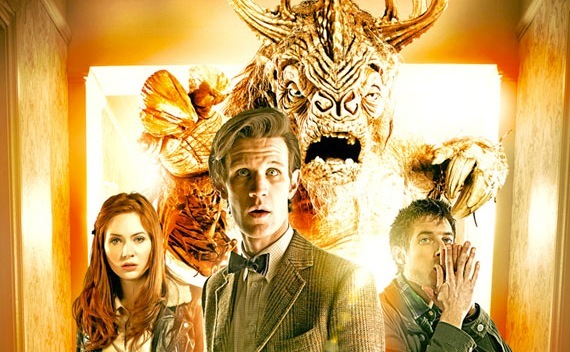 Can The Doctor save everyone or will they all be consumed by the strange creature which lurks in the shadows and feeds off faith itself? The plot of this story is interesting but the episode did not live up to expectations. The beginning is excellent and sets the story up well. However, the episode degenerates when the Doctor and Co. run around corridors in a Scooby Doo fashion for no apparent reason. The final scenes are not really part of the story but more of the story arc and feel at best awkward. The scene where The Doctor breaks Amy’s faith feels too reminiscent of The Curse of Fenric when Mcoy’s Doctor has to break Ace’s faith in him or she will be consumed by Fenric. The threat and the way the scene is written feel too similar. Amy and Rory’s apparent departure are well written but as I’ve said are disjointed from the story. This makes the whole episode a mongrel piece, mixing in drama, comedy and sadness. Unfortunately, it is more like a first draft than a well polished script. The regulars are at best okay. Smith, however, plays the lonely god side of the Doctor very well. Moreover, his sadness at the death of The Minatour is poignant and convincing. David Walliams (Little Britain) plays Gibbs, the scheming, gutless, passive aggressive creature. Walliam’s performance produced good comic relief in this odd story. Amara Karan was brilliant as the potential companion who sadly dies at the hands of the Minatour. The costume of the Minatour was exceptional and deserves an action figure. The creature’s costume depicted an ancient being who could be worshiped as a God. The directing was not remarkable. The laughing doll creatures were the most memorable. The episode is not my favourite of the series but it’s not the worst (Cure of the Black Spot, The Almost People). The whole thing was confusing and not properly put together. One thing is for sure, whatever is lurking in The Doctor’s room, will soon be revealed.